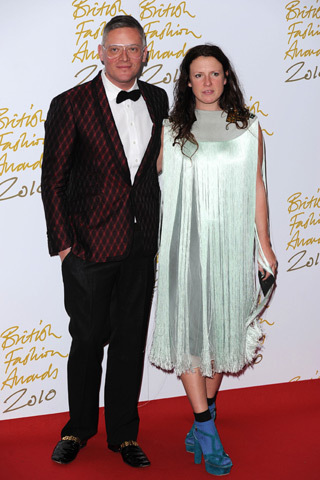 British Fashion Awards 2010, it's the British's answer to the CFDA. It is much like the Fashion Oscars and it has happened last December 07, 2010 at the Savoy Hotel in London. The British Fashion Awards recognize the most influential people in fashion today and celebrate the reputation and development of British fashion. Now, on to the fashion. A lot of women wore Spring 2011 even if its a season early. First on the list, is Alexa Chung. The winner of the British Style award wears a pink dress from Chanel's Spring 2011 collection. The award given to her was decided by public vote. The British Style award recognizes an individual who embodies the spirit of British fashion and is an international ambassador for the UK as a leading creative hub for fashion. Next is actress Emma Roberts, who wears a blue cut-out dress from Julien MacDonald's Spring 2011 collection. She styled the dress with black tights and booties. Nominated for Best Designer Award, Victoria Beckham wears (well, what do you know?) Victoria Beckham. The dress is from her Spring 2011 collection and features a thigh-high slit. Another red carpet beauty arrives in Spring 2011 garb, it's Thandie Newton wearing Peter Pilotto. The dress has an interesting length and neck. Cute-sy! Let's move on to two who got it right, wearing Fall 2010, Claudia Schiffer and Daisy Lowe. Claudia wears a Mary Katranzou dress styled with black tights and a clutch. Although I wished she went all the way with a longer dress/gown. Just like Daisy Lowe, seen here in an Elie Saab Fall 2010 gown. Her haphazardly styled hair acts a counterpoint to the formality and elegance of the gown. Naomi Campbell rocks a black gown custom-made by Sarah Burton of Alexander McQueen. The supermodel won a Special Recognition Award for being beautiful all the time. Nah! Seriously, the award is for an individual who has greatly contributed to the fashion industry, as a hugely influential ambassador for British fashion. Lara Stone who won Model of the Year wears a white Calvin Klein dress. Phoebe Philo of Celine won the ultimate award of Designer of the Year. Daphne Guiness and her goddess gown were also present. Er, probably not, they were just photographed together and looked the part. Emma Roberts and Daisy Lowe are my favorites! Thanks for your comments... I love Daisy Lowe in this, too!! !